The present volume is a compendium of tantric texts which deals with the vivid description of various subjects of tantric literature. Some works carry the information of different subjects of tantra cult. A lot of Manuscripts contains the philosophy of tantras, worship of different aspects of Sakti of divine mother, blackrites, all members of kaula sect of the Saktas, medicines, science of sounds, history, anthropology, astronomy, yantras of deities etc. Few commentaries are also corroborated to this book which help us know the time of some little- known authors of ancient India. As a whole this work will open a new horizon in the field of research of tantric Manuscripts as well as the unknown history of tantric literature. Professor Dr Satya Ranjan Banerjee, M.A., Ph.D (Calcutta), Ph.D (Edinburgh), D. Litt. (Honoris Causa, R.B. University), Prakrta- Vidya-Manisa (JVBU) , FAS (Calcutta) is a doyen of Indological studies. 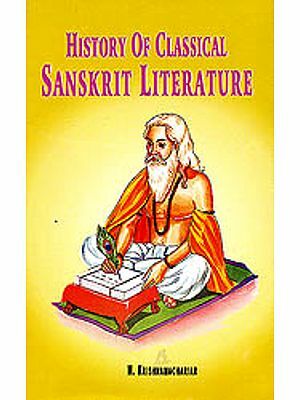 He was a Research Fellow in the Asiatic Society, Calcutta, and got many honours and awards for his proficiency in Sanskrit, Prakrit, Linguistics and Jainism. He was awarded a certificate of honour by the honourable President of India for Prakrit and Pali. He was made Emeritus Professor of Prakrit by the Jaina Visva Bharati University. He was a Professor of Linguistics at the Calcutta University. On invitation he lectured at different Universities and Institutions. He is an octogenarian and is always at the favourite table even now. Dr Bibekananda Banerjee did his MA in Sanskrit with Veda as the special group and then he obtained Acharya (MA) from the Rastriya Sanskrita Sansthan, New Delhi, with gold medal. He started his career as a guest lecturer in Sanskrit. Side by side he successfully completed one-year certificate course in Manuscriptology. He also earned reputation in the study and research of manuscripts. Dr. Banerjee has been working in the Asiatic Society as a Sr. Cataloguer and compiled four volumes of Descriptive Catalogue of Sanskrit Manuscripts which will soon be published from the Asiatic Society, Kolkata. He has to his credit some research articles published in different periodicals and journals. He also attended National and International conference and read out some research papers in India and abroad. An academic' institution containing huge number of manuscripts on different topics required also their Catalogues for the benefit of and easy handling by scholars and researchers. Dr. Bibekananda Banerjee, a Senior Cataloguer of the Asiatic Society, has prepared the Descriptive Catalogue of the Tantrik Manuscripts deposited in the Museum of the Asiatic Society, which were earlier collected from the Fort William College which, many years back, had ceased to function. 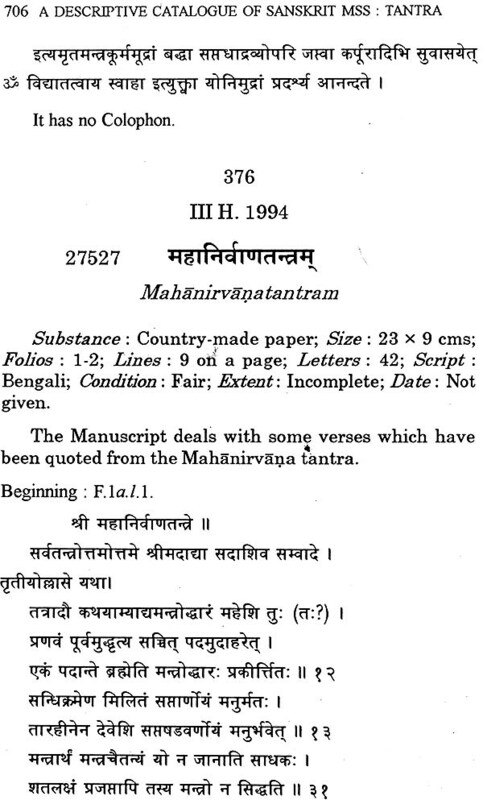 A good number of Tantrik Manuscripts had already been Catalogued by eminent Indologist MM H.P. Sastri and the present volume is a new one. 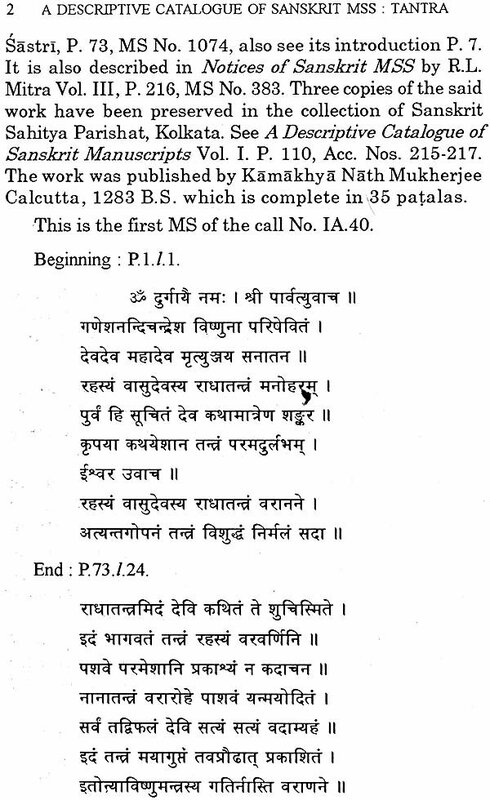 Dr. Banerjee's Descriptive Catalogue includes the names of four hundred Tantrik Manuscripts and to prepare the one he has followed the methods shown by his previous scholars, though new methods current at present-day have been persuaded. Professor S.R. 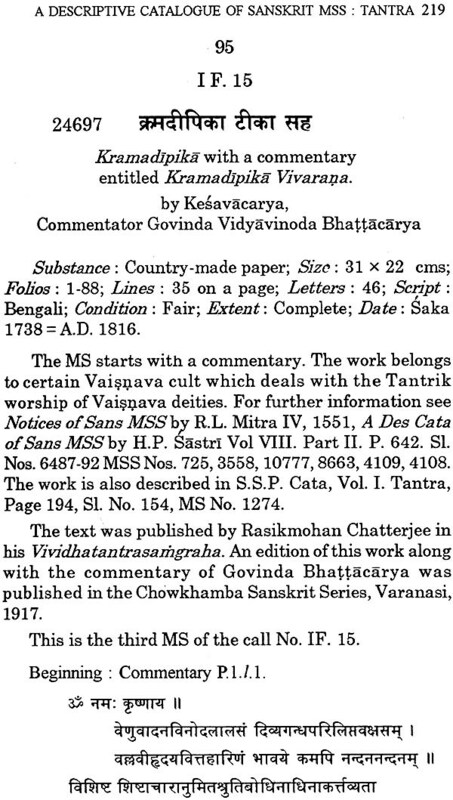 Banerjee's 'Introduction' to this Catalogue is a store of information about the Tantrik literature as a whole and he has shown as to how Bibekananda Banerjee has prepared this work with praiseworthy efficiency. This Descriptive Catalogue would be a valuable addition to the field of Manuscriptology. 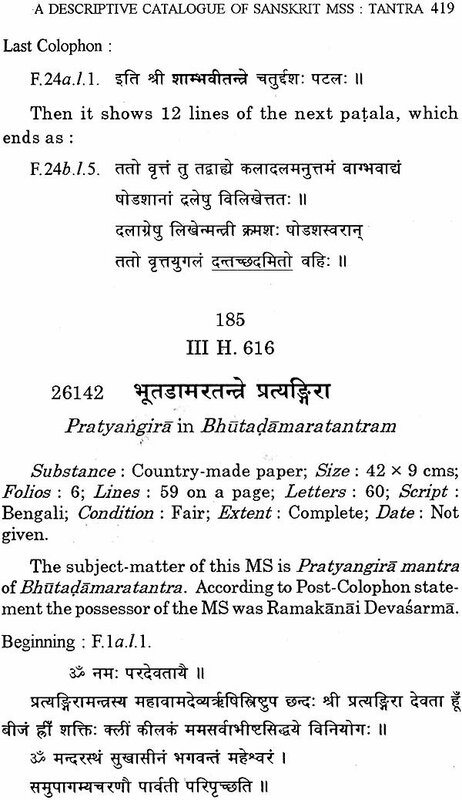 The study of Manuscripts (=MSS), the depository of ancient thoughts and culture, must be made in a 'proper way, for which, a Descriptive Catalogue of all types of Manuscripts must be published in order to check up the contents of the manuscripts. The Asiatic Society has been doing this job for more than a century ago from now. The two famous learned men like Raja Rajendra Lala Mitra and Mahamahopadhyaya Haraprasad Shastri were engaged in this respect. The manuscript-studies are associated with these two persons for a long time. 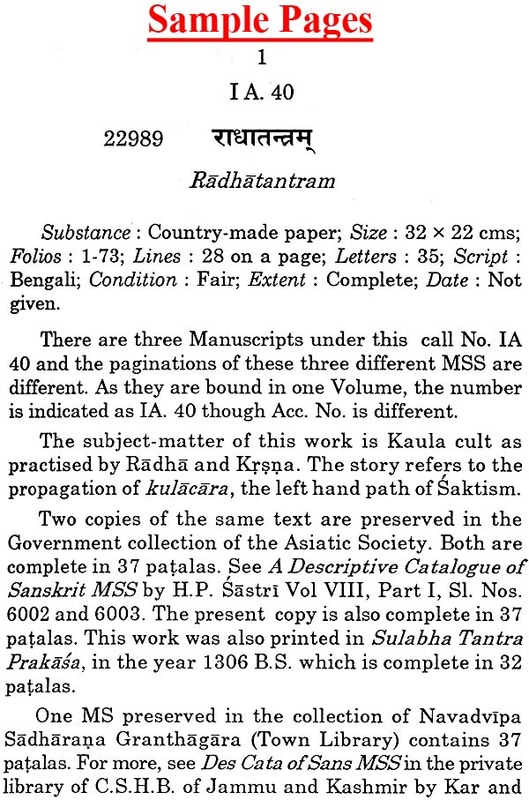 As early as 1838 the Asiatic Society published a hand list of all the then manuscripts of the Asiatic Society in the name of Suci-pustaka. This is, in fact, the first publication of manuscripts of the Society. Before that, the wife of Sir William Jones published his collection of writings, in which Jones' collection of manuscripts was also published. It was published in 1807. Chronologically this is the first publication of Catalogue of manuscripts. 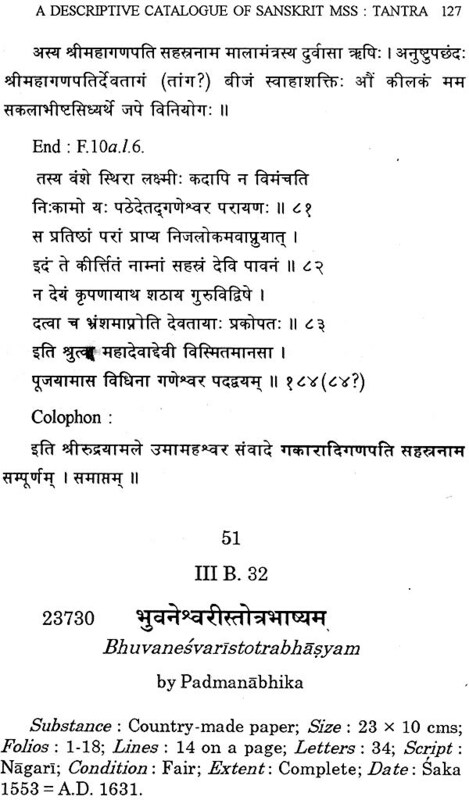 In the middle of the nineteenth century one Pandit Hrisikesh Shastrl wrote to the then Viceroy of India, that the manuscript catalogue should be prepared in order to know the position of manuscripts in India. After much hubbub, the Viceroy of India sanctioned this project and the onus came to Raaja Rajendra Lala Mitra and Mahamahopadhyaya Haraprasad Shastri, and the Asiatic Society in general. In the first instance, Raja Rajendra Lala Mitra took the charge and after him, Mahamahopadhyaya Haraprasad Shastri took over. The Asiatic Society has three types of collection of MSS, namely, the Government collection, the Indian Museum collection and the Asiatic Society collection. 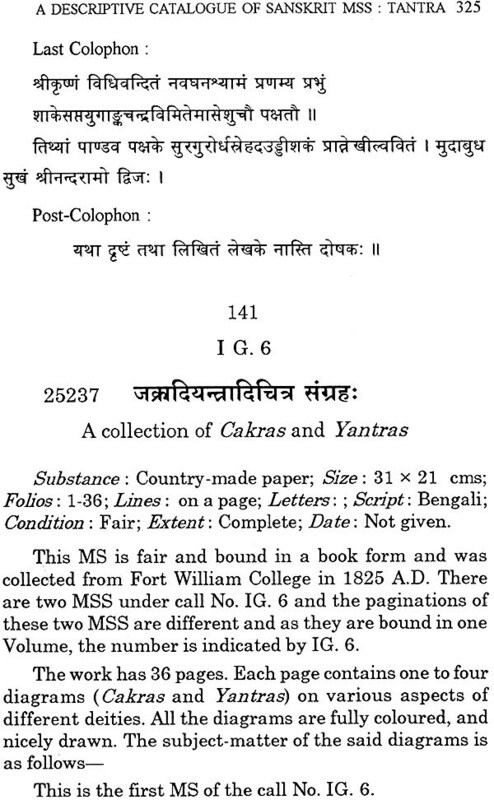 The Descriptive Catalogues of all the collections were published gradually by Raja Rajendra Lal a Mitra and followed by Mahamahopadhyaya Haraprasad Shastri. The present compiler, Dr. Bibekananda Banerjee, is a true follower of his previous scholars. He is a good compiler of manuscripts and working on it for a long time. He has done the Descriptive Catalogue of Tantra, Smrti, Kavya, Puranas, Indian Philosophy and so on. He has followed the methods of his previous scholars along with the latest methods of the present day, and there is hardly any lacuna in his system and the present one is a gurantee of his scholarship. The present volume is a Tantra one. He has collected, at least, four hundred manuscripts in this volume. He will be a good scholar in the field of Manuscriptology in the long run. The Sanskrit language of the Tantras is quite interesting and it represents a type of Sanskrit which is bad on the one hand and vulgar on the other. This language can be compared with the vulgar Latin in Europe. But when this Tantra type of language began to appear in the text at a very early period cannot be said with certainty. It is assumed that the earliest date of the Tantras cannot go back to second century AD., the most of the Tantra literature started to appear from the fifth century AD., of which, again, the major portion appeared in the 8th or 9th century AD. Linguistically, therefore, this is a time of Apabhramsa at the one hand and the rise of modern vernaculars on the other. There should be a thorough and careful systematic study of the Tantra literature, so that we can positively and genuinely say that the language of the Tantra literature, particularly after the 10th century AD. 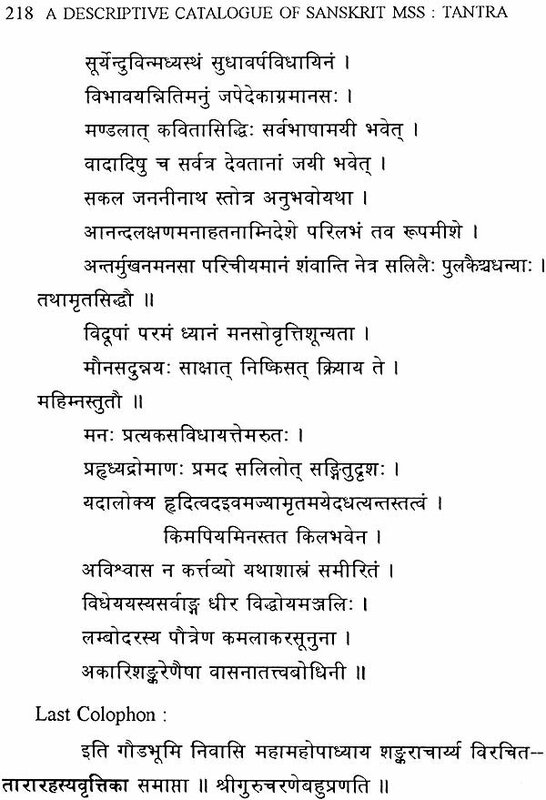 is greatly influenced by the Prakrit (Apabhramsa) on the one hand and New Indo-Aryan languages on the other. We should not be surprised to see grnha instead of grhana which was made by hyper Sanskritisation of Prakrit word. 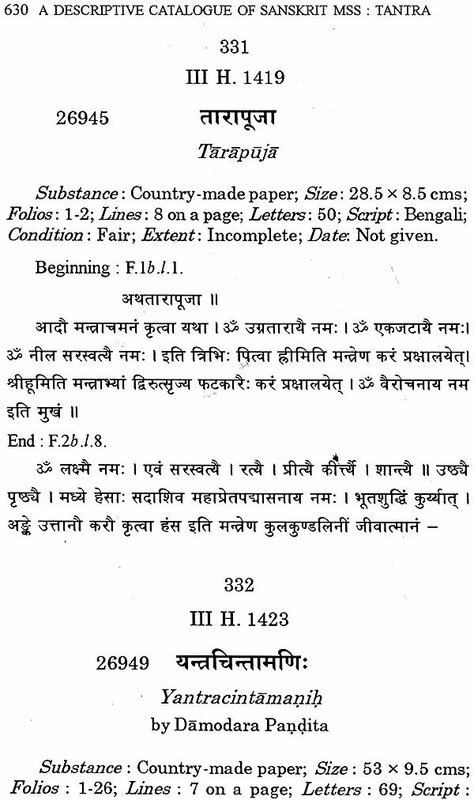 As, at the most, the manuscripts are written in Bengali script the influence of Bengali is inevitable. 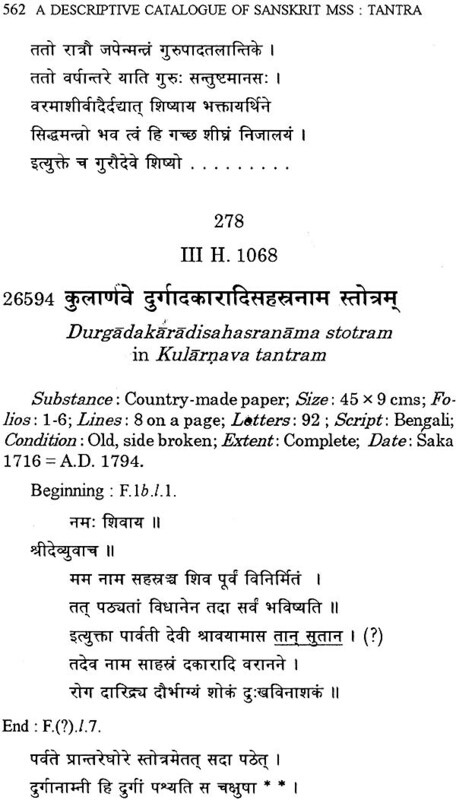 In the whole range of Sanskrit literature, it is pretty certain that irrespective of the earliest date and the original place of the Tantra literature, it seems quite possible that the Tantra literature is written at a time when the Sanskrit language was greatly influenced by the "popular speech" of the sectarian people like the Jaina Sanskrit and the Buddhist hybrid Sanskrit literature. 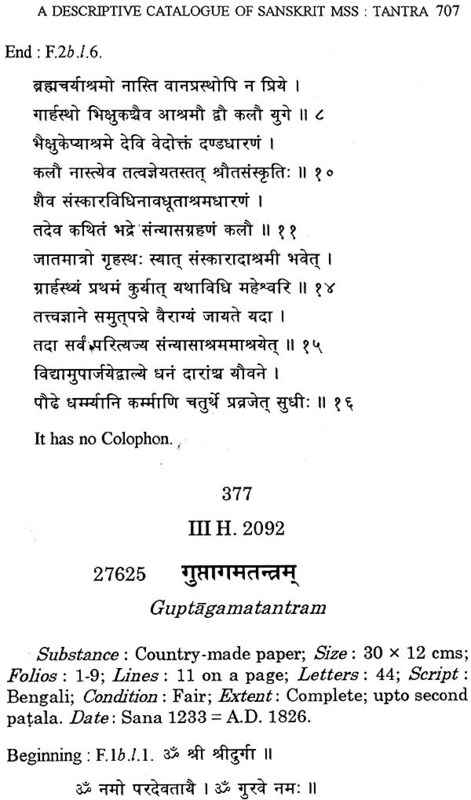 The basis of this language is the Buddhist and Jaina Sanskrit. There are many solecisms, i.e. 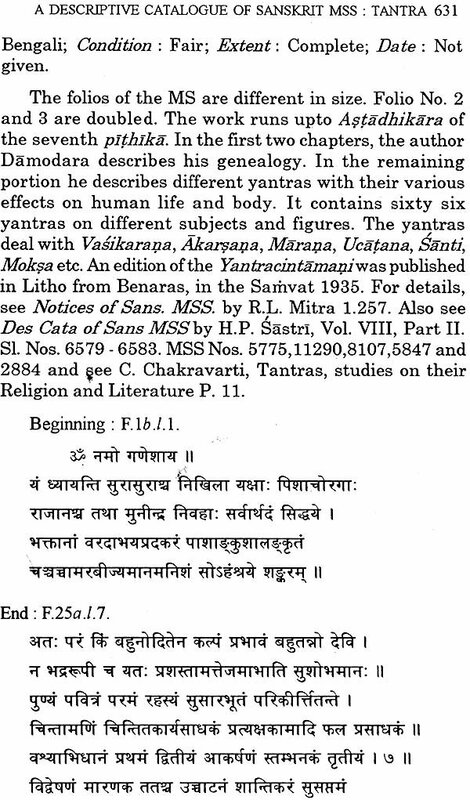 'barbarous and ungrammatical' Sanskrit in the Tantra literature. It is a fact worth noting that almost in Tantra MSS, the substance used for writing is the country-made paper, birch- bark and palm-leaves. Normally the materials used are good, but owing to profuse handling some torn folios are found at the end. The manuscripts in palm-leaves are older than the others, the birch-bark MSS are better than the country-made paper. 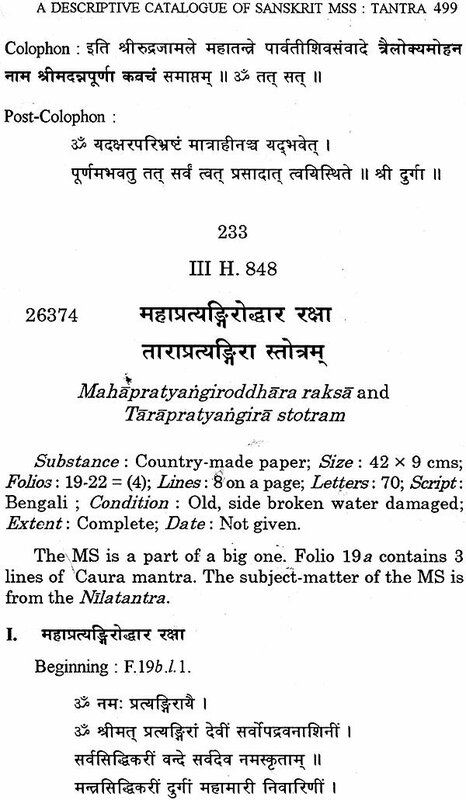 Some of these MSS are in brittle condition, while the MSS in country-made paper are in majority and not very old. The Museum of the Asiatic Society is a store-house of manuscripts in different languages and scripts. 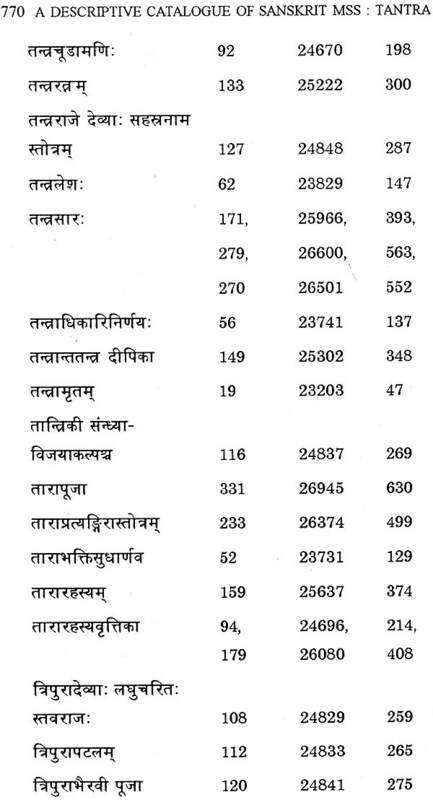 A good number of catalogues have been published by the Asiatic Society both in Descriptive and Tabular forms which are remarkable deeds in the study and research of manuscripts. The Manuscripts collection of the Asiatic Society has a history. The Manuscripts are collected in three phases. The Society started collecting the Manuscripts as a store-house of ancient learning from 1786 rather since its inception in 1784. According to the report of MM Haraprasad Sastri regarding the history of the Manuscripts collection, Sir John Lowrence took up a plan in 1868 and made arrangements with provincial Governments for the collection of Manuscripts and proper preservation of them. The then Government of India sanctioned an annual grant of Rs. 24,000 for this purpose. Bengal got a share of Rs. 3,200 which was made over the Asiatic Society. Raja Rajendra Lal Mitra had collected the Manuscripts through that fund. (Manuscript Collection of the Asiatic Society, Bicentenary Souvenir). By this way this collection is known as Government Collection Manuscripts of the Asiatic Society. From the two old Registers of the Government Collection Man uscripts we came to know that the total Manuscripts of this collection is 11,379. It is also noted that the second Register contains the MSS Nos. 10,444 to 11,379 which were collected between the years 1911 and 1912 (old Register of the Government Collection Manuscripts, No. 2). But unfortunately the first Register has no date. In order to know the sources of Collections, the Society used to call it as a Government Collection. These are known by separate call Nos. which begin with capital 'G' (Government). In similar way MM Haraprasad Sastri had purchased, on behalf of the State Government, near about twelve thousand of Manuscripts and these were kept in Indian Museum for along time. Between the years 1914 and 1918 the aforesaid collection of Manuscripts came to the Museum of the Asiatic Society with the intention of preserving them carefully. This collection of Manuscripts is known as Indian Museum Collection. These collections were also Catalogued by different numbers from Government Collection which begins with the capital letters I.M. (Indian Museum). The third type of collection was made by the Asiatic Society separately of its own. Most of the Manuscripts of the Fort William College Collection came to the Museum of the Asiatic Society which were included to the Asiatic Society Collection. And till now the Manuscripts are coming to the Museum of the Asiatic Society by purchase or gift which are included in the Asiatic Society Collection. They are also known by different numbers which begin with the capital letters S.C. (Society Collection). So three numbers for the different collections of the Manuscripts are simultaneously found in the Museum of the Asiatic Society at present. In this connection it may be noted that more than one thousand Tantrik manuscripts in the government Collection of the Asiatic Society have been prepared by MM Haraprasad Shastri and revised and edited by Professor Chintaharan Chakraborty in two parts. The first part was published in the year 1939 (MSS nos. 5804-6451) and the second part was released in 1940 (MSS nos. 6452-6852). 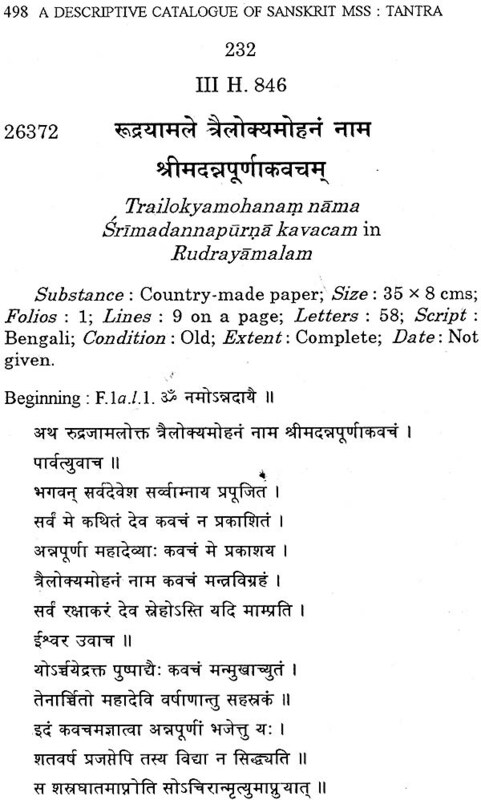 Both of these parts are highly valuable work in the field of manuscriptology and in the study of Indology. 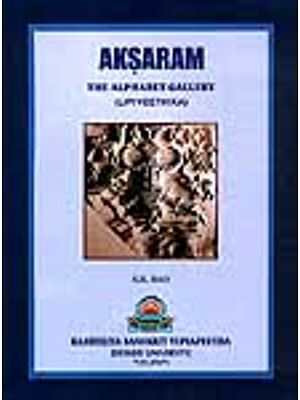 This Descriptive Catalogue of Sanskrit Manuscripts contains the manuscripts of the Tantrik texts deposited in the Museum of the Asiatic Society in the name of Asiatic Society Collection. This is the first time the Descriptive Catalogue of Tantrik Manuscripts of this collection is being published. A good number of the manuscripts of this collection have been collected from the Fort William College. 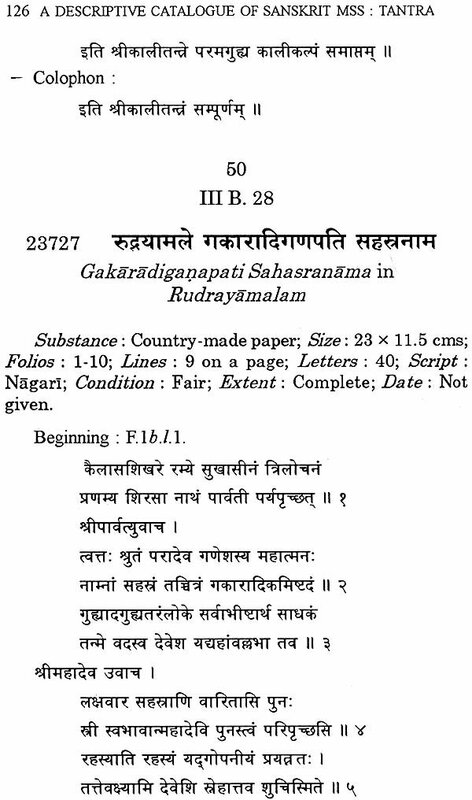 In the beginning, the Principal of this College Dr. Carey collected the available Sanskrit works by purchasing and by transcription. Most of the copies were made between the end of 18th century and the first quarter of the 19th century by the learned copyists appointed by the College. When the College was abolished, Dr. Carey and Gilchrist handed over the manuscripts to the authorities of the Asiatic Society. Most of the manuscripts of this collection are hand- written on country-made paper in black ink as a whole and bound in book-forms. Though some of the manuscripts of the Asiatic Society Collection have been described by Dr. Pulin Bihari Chakraborty, Narendra Nath Vedantatirtha and others, but most of the manuscripts of this collection have not yet been catalogued and published. In this context we may say that, the then Assistant Librarian Pt. Girijanath Bhattacharya made a hand- list of the manuscripts of the Asiatic Society Collection but he left it incomplete. The manuscripts of the Fort William College are bound haphazardly. Some other manuscripts are mixed up with the main manuscripts. I could not alter the order because it is already bound. In some cases the bound forms of manuscripts which belong to different subjects with one Call No. are difficult to catalogue. Even some complete texts contain few lines only having different subjects. So in the case of the said problem, the Accession Numbers or Run-on numbers can be separated from each manuscript. 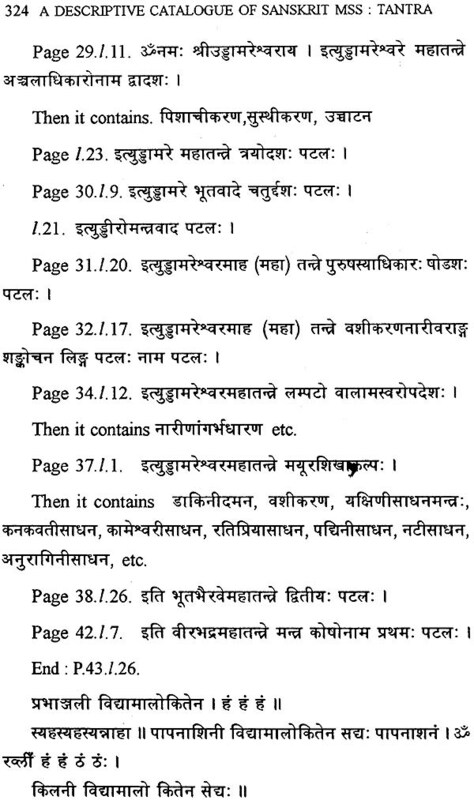 In this connection it is noted that a lot of corrupt texts has been catalogued in this volume. There are many manuscripts having without author and mentioning without number of chapters. Sometimes the compiler faced problems in deciphering and identifying the MSS properly. The Tantra texts are so full of uncommon terms that it is sometimes not possible to identify the correct forms Of these terms. There are many printed books which read differently in many places- sometimes it is illegible. I have tried to amend them, where it is not understandable, I have left as it is. I believe, these lacunae could be corrected at the time of editing an individual manuscript. To prepare a Descriptive Catalogue of manuscripts need lots of information to include them in a book form. It is also necessary to mention whether that manuscript is ever printed for guidance to the scholars. I have tried to supply the above information as far as possible. It is noted in this connection, that the Tantra Catalogue published from Sanskrit University Library, Sarasvati Bhavan, Varanasi, collected during the years 1791- 1950, (vol. VI, 1960) is very useful to know more pieces of information of Tantrik manuscripts which are described in this volume. 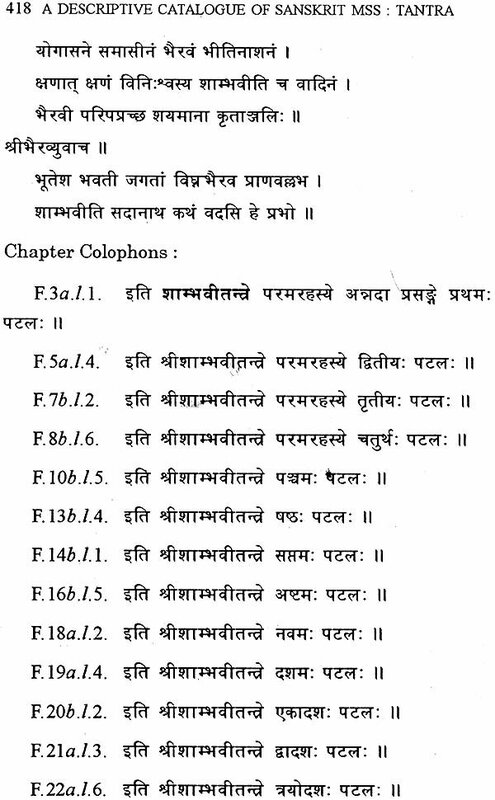 A Title indices, one in Sanskrit alphabetical order and the other in English alphabetical order, and the subject index have been added at the end of the book. 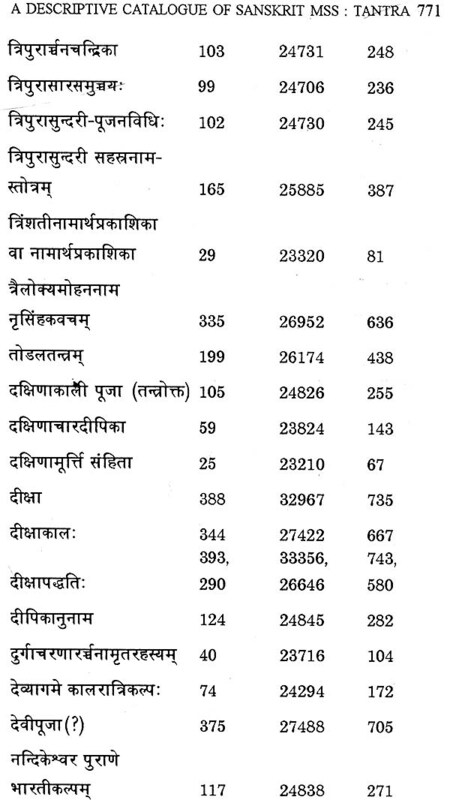 The author index, scribe index and the list of dated manuscripts are also given. Indira Gandhi National Center for the Arts and D. K. Printworld Pvt. Ltd.